Maxwell manufactures Over-arm separator discs from steel. They are polished with tapered sides and rounded edges. These hard discs prevent edge damage to your strip and last longer than the standard discs offered in the industry. Discs can be manufactured to your dimensions & as per drawings. 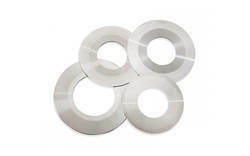 Looking for Overarm Separator Discs ?